Should Texas go Winner Take All? RNC Changing Presidential Primary Rules? 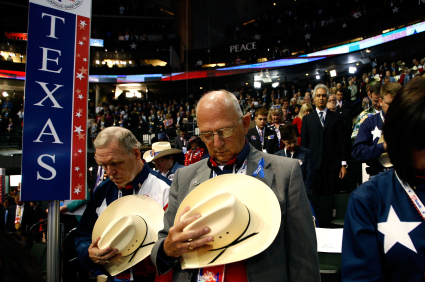 Should the Republican Party of Texas go back to winner take all? The State Republican Executive Committee (SREC) will vote on Feb 29th, 2012 to change the rules and approve a Temporary Convention/Delegate Selection Plan. Should the SREC vote to also change the RPT Presidential Delegate Selection Rule 38 from proportional back to winner take all? Also, should the RPT change the rules to allow the presidential delegates to be uncommitted after the first committed vote at the National Convention? In other words, if no presidential Candidate has a majority of the votes to win the nomination, the Texas Delegation would be able to be a player in a brokered convention by having the ability to team up with other delegates from other states and select the next Republican Presidential Nominee? Proportional might sound good vs winner take all because under proportional the candidates get a proportion of Texas delegates based on the percentage of the votes they get in the state Primary Election. The problem is that proportional weakens states rights. With proportional we might as well just have a big nation-wide popular vote. With winner take all, the State of Texas (as well as all states with winner take all) has a much bigger impact on the Presidential race because the candidate who wins Texas really does win Texas and gets all of the delegate votes from the State. Same thing with the Electoral College. The President does not win by a national popular vote. The President wins by the electoral college and he wins by winning the most states, not the most people. It is all about states rights and not about a national popular vote. With Texas having such a late election, we need all the power we can to have an impact on the Presidential race! What was the Republican National Committee thinking when they decided to let 4 states go ahead of everyone else without a penalty? What were they thinking when they FORCED the Republican Party of Texas to have a diluted voice in the Presidential Primary by making Texas change from winner take all to proportional? State Parties do not even control their Primary Election date, the State Legislatures do. The RNC was just not thinking when they created these new rules! Texas, which now has a late primary because of the redistricting battle, will have an even weaker voice because it is no longer winner take all. With the National Republican Presidential race dragging on because of 4 candidates splitting delegates, Texas still might have a huge impact even with a late primary. That huge impact is minimized because we are no longer winner take all. I have advocated that the Republican Party of Texas should stand up to the RNC and change the rules to go back to winner take all. Some states, like Florida, just told the RNC to go take a hike and did not follow the timeline rules put forth by the RNC. Texas should do that too if the RNC does not allow us to go back to winner take all. Another issue of course is the DOJ. The DOJ likes to extend the unconstitutional voting rights act on the RPT, a Private Political Organization. A change back to winner take all would have to be cleared by the DOJ. We could just sue the DOJ though for unconstitutionally applying the voting rights act onto the RPT, which is what I have advocated also! FINALLY, the RNC is realizing that their plan is not working. Republicans are weighing a change to the party’s presidential primary rules amid fears this year’s prolonged nomination process is hurting the GOP’s chances of retaking the White House. The problems with the current system were discussed at length at both the most recent Republican National Committee meeting and at the Southern Republican Leadership Conference last month. Top RNC committeemen plan to reconsider the rules at the next RNC meeting, slotted for late spring in Phoenix. The RNC adopted a new rules system in 2011 in order to try to control the mad scramble for early primary dates that had occurred in years past, partly because of the view that John McCain locked up the nomination too quickly and that a longer process would have helped the GOP find a stronger candidate. The new system created a rigid calendar and strong penalties for states that moved their contest's date up, including the loss of half a state’s delegates and a proportional rather than winner-take-all system for states that voted before April. The two goals were to keep the primary season out of the holidays and to prolong the system so lesser known candidates would have more of a chance. Florida’s decision to break the new rules and vote early anyway set off a calendar scramble that pushed Iowa’s caucuses to Jan. 3. Many Republicans are now worried that the second goal has worked too well, and that the long primary is hurting the candidates. One prominent critic of the current system is New Jersey Gov. Chris Christie (R). “These RNC rules that turned to proportional awarding of delegates, this was the dumbest idea anybody ever had,” he said on Fox News on Thursday. “You're running against an incumbent president who will not have a primary, so your idea is make ours longer so we can beat each other up longer?” Some Republicans worry the extended primary is draining their candidates’ coffers, leaving them at a financial disadvantage against Obama. “People do have concerns this has gone on longer than they would like and cost more money than they would like and created more thunder and lightning than they would like. That is a result of people going before the time allotted in the rules," said John Ryder, an RNC committeeman from Tennessee who came up with the idea to assign delegates proportionally. "And had the states complied with the rules the calendar would have been more compressed, orderly and less costly." Ryder predicted that the RNC would seek to strengthen the current rules. “I think the key change is going to be to try to find a way to encourage states not to jump line the way Florida did this time," he said. "I don’t know whether that’ll be an increase in penalties or some other device that can affect their decision process." RNC spokesperson Sean Spicer said it was too early to say whether this year's primary process would have any effect on the general election. Most observers still predict that the primary will be all but over by late April and say that would give the nominee plenty of time to raise money and prepare for the general election. But they all said that if the primary dragged into the summer, it could hurt the eventual nominee and that a brokered convention would be a disaster for the party. Thus far, none of the Republican candidates are even close to hitting the 1,144 delegates needed to lock in the nomination. At the current rate of distribution, the earliest a candidate could have the necessary delegates is late April. Continue reading The Hill article here. David, I never did hear if the RNC had decided to apportion the delegates after Florida's primary. Under the rules that the RNC had, Florida was punished for going ahead with an early primary, plus they were not supposed to be winner take all. I am strongly for Gingrich. I hope that the RNC approves winner-take-all for Texas, because I have faith that Texans will choose the best person to be president. You mean like GBush? Thanks but no thank you. Proportional is the fairest way.